Education especially among women is cornerstone for social development to improve the prospectus of general welfare of society. Educationwould actually accord women certain advantages in areas where they have traditionally lacked, access or differential rights. Empowerment of women and their educational and economic status is inextricably concern of SAKTI SIKHA as a thrust area. SAKTI SIKHA takes women education & skill development programmes on a priority basis. This programme gives the priority to the education of adult women. It aims at making women more conscious of their rights and responsibilities and to achieve economic capability and also importance of their socio – economic development. • Providing free study material to women to ensuring their education. • Educating them in a group. 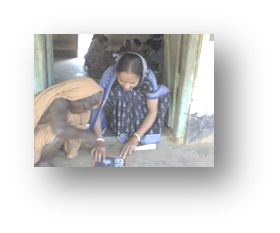 • Promotion of literacy & skill development. • Promotion of accounting for group dynamism.